Editor's note: We've been very interested in how e-commerce companies bring some of the in-store experience online. Nick End is one of the co-founders of Shoefitr, a virtual application that helps consumers determine the fit of a shoe while shopping online. We were excited to get his perspective about the e-commerce landscape, and learn more about how the Shoefitr team is trying to bridge the in-store and online gap. Nick can be contacted via Linked In or via email at nick@shoefitr.com. Sales people—an important piece of the shopping experience since time immemorial—don't exist in e-commerce, leaving a void online retailers are still trying to fill. As shoppers, we rely on sales people to distill marketing messages, analyze/test products, and compare all the products a store sells. When we walk into a store we can ask questions like, "which toaster has the widest slots," "which lawnmower is the quietest," and "which shoe is right for me." Wouldn't it be great if we could easily ask these questions when shopping online? The early days of e-commerce saw sales of products that were easy to buy online. Books sold because the genre, author, title, and a brief description give you all the information you need. Slowly e-commerce grew and we started buying all types of products online. To close the in-store/online gap, retailers started offering hi-res product images, shopper reviews, and free shipping and returns. However, two pieces of the in-store shopping experience that have yet to be replicated are the sales person and the tactile experience. In most situations, these are one in the same as the sales person can often advise on the tactile experience. Sales people provide meaningful information distilled to a level that is easy to understand and act upon. While many retail sites offer product information and pictures, the information is typically an exact copy or a paraphrasing of the manufacturer marketing blurb and pictures only provide visual information. Take a read through the following two descriptions for a toaster and a shoe. But the two statements above provide no real information – they’re just marketing fluff. If I am buying a toaster because I can’t fit bagels in my current one, I am going to be looking for a toaster with wide slots. This would be easy in a store, but online I have to try and judge slot size based on pictures and customer reviews. Even then, I don’t know if the toasters with wide slots are wider than the slots of the toaster I currently have. Information as simple as dimensions of product features would make this decision easier. Beyond toasters, there are products that are even harder to buy because it’s not possible to measure the features that are important. These are scenarios where good sales people test the products in order to provide feedback. Let’s use shoes as an example. The main characteristic shoppers think about when it comes to shoes is style. Product images solve this problem; however the next most important characteristics shoppers think about are fit and comfort. While fit and comfort are secondary, they are characteristics that cannot be assessed through most websites. In a store, a good sales person knows which shoes are good for people with various foot types and a shopper has the opportunity to try on multiple sizes of shoes and various models. Providing fit and sizing information on retail web sites is the next frontier for e-commerce and a void that many virtual fit companies are trying to fill. Shoppers want to know what products are right for them, why they are right, and what the tradeoffs are from one to the next." At Shoefitr, we design our applications to mimic the in-store experience. For example, when a customer walks into a shoe store, the shopper will typically explain to the sales person what shoes she likes and what she is looking to buy. Once that information has been distilled, the shopper will try on a few different styles and several different sizes until she finds the one that works. There is rarely a situation in which a shopper walks into a shoe store, talks to the sales person, and purchases a shoe the sales person suggests in one size without trying it on. It is for this reason that we develop applications that mimic the in-store experience. Some websites and virtual fitting applications for clothes simply recommend a size to the shopper and expect that information to be sufficient. It's not. 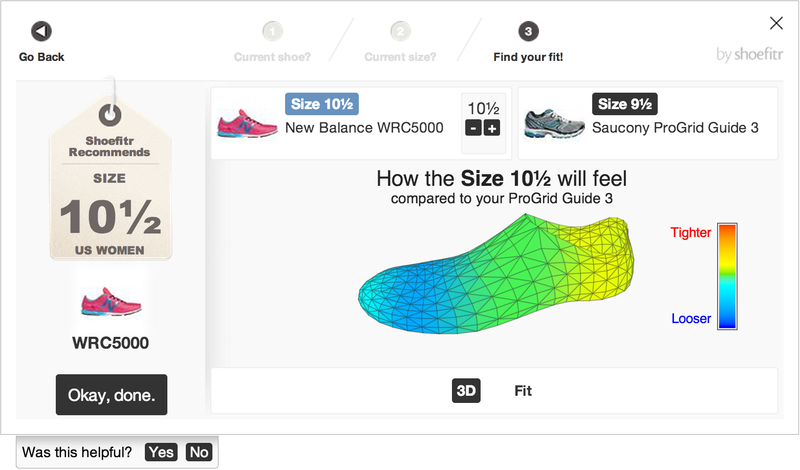 Our application provides a size recommendation but also includes visual interfaces that show the shopper how a certain style will fit and how various sizes will compare to a shoe she already wears. We also have applications that recommend shoes similar to ones the shopper already owns but instead of recommending one shoe with a link to add to cart, we recommend a handful and we provide information explaining why the shoe is similar. Such information includes statements like “this shoe is lighter than your current shoe,” “this shoe is also for neutral runners,” and “this shoe has a similar heel to toe drop.” Because we touch all the products in our application, we are able to measure and quantify all the characteristics that may be useful to shoppers. As applications like ours evolve, online retail is getting closer and closer to recreating the in-store experience.